Even if it’s already passed, as announced, I want to share what I saw during this event. I arrived in Las Vegas on the 8th of June, just in time for registration, and then had to sleep to recover from the jet lag. On the 9th of June, before starting the day, I had a strong thought for my daughter who was celebrating without me her 17th anniversary today. Happy birthday Ségolène !! The event is just enormous this year. 10000 customers are around ! The exhibition hall is twice or three times the size of the already large HP Tech Forum one I visited the last 2 previous years. There are partners all over the place exhibiting + huge HP booths on all what we can deliver, and believe me, we can do a lot !! I now understand why they changed the location for this year, as they were probably in need for a larger convention center than the Mandalay Bay one (which was the largest I knew before ;-)) All of that is just impressive. I was in the first set of sessions today at 8:00AM to speak about RISC/Unix to ProLiant/Xeon/RHEL migration. Hope the about 35 people in the room got the message correctly, even if the jet-lag was not completely absorbed. 40% of growth in data per year (0.8 ZB in 2009, 35 in 2020). Exponential data growth with regards to budget growth. Goal is to create a disruptive techno to support analytics of these large data set. Disconnect between customers asking for Industry Standard Technologies, cost effective, real time, distributed, … and buying Oracle Teradata. Area of intrest in Web 2.0 gaming, Telco, Oil and Gaz, FSI, … 350+ customers. Vertica is ACID compliant, SQL compliant. Not recommended on continental sites. No BLOB support (put them in Hadoop). Customer example: Zynga 2PB graphical representations of social connections. They have a UDx C++ framework in 5.0, going beyond SQL and an Hadoop connector. The software is 37 MB. It supports RHEL, SELS, Fedora (ext3). And it works with BO, SAP. They don’t have their own analytics apps. They rather partner with SAS, ETL. Oracle migration is straight forward at schema level. No support for stored procedures. Vertica provides tools to help for migration. The technology looks impressive and I’ll have to see how we can cooperate with them to host a demo in our Solution Center. The rest of the day was dedicated to a Red Hat meeting, in particular with Karthik Prabahkar who took time to explain to me the whole Cloud approach at Red Hat, being their Technologist on the subject. I have now a much better view on Cloud Forms, DeltaCloud API and OpenShift, how they articutate, what is coming and how all that can fit with the HP portfolio 😉 A lot of fun coming ! The night was the opportunity to see Paul Mc Cartney himself in concert. It’s really impressive to hear Beatles songs sung by one of them, on stage, with always a great energy and excellent musicians around. Even if that’s not my prefered type of music, I enjoyed it a lot, much more than I had expected. He is a great musician and worth hearing in concert. The 10th of June was a short day, as session were only delivered in the morning. After a short private meeting with Kristin Lampka of Intel to sync up on our activities, I covered our HP|Intel|Red Hat Open Source Solutions Initiative first, which gathered some 20 people (not too bad for an early session when everybody is leaving it seems). Had 2 contacts afterwards that may lead to some activities later on. I then followed-up immediately with a session on MondoRescue to which about 12 people attended, including a satisfied user 😉 It’s so nice from time to time to get good feedback as a change to all the problems reported on the mailing-list !! It was then time to lunch and I had the great pleasure to pass this moment with Marc Nozell, working in the US in our Partners group (PTAC) and who has always interesting views on the IT industry and Open Source in particular. We had a very good discussion in particular on the future of IT usage, especially by tennagers, private data manipulation, Facebook and all what you can imagine around such as combining that with face recognition and all the trouble it could generate. Was generating good thoughts as well as being entertaining. I passed the rest of the day sorting the tons of mail accumulated through out the week and left the US on Saturday. Should be back in August for a longer period this time, but in Houston. 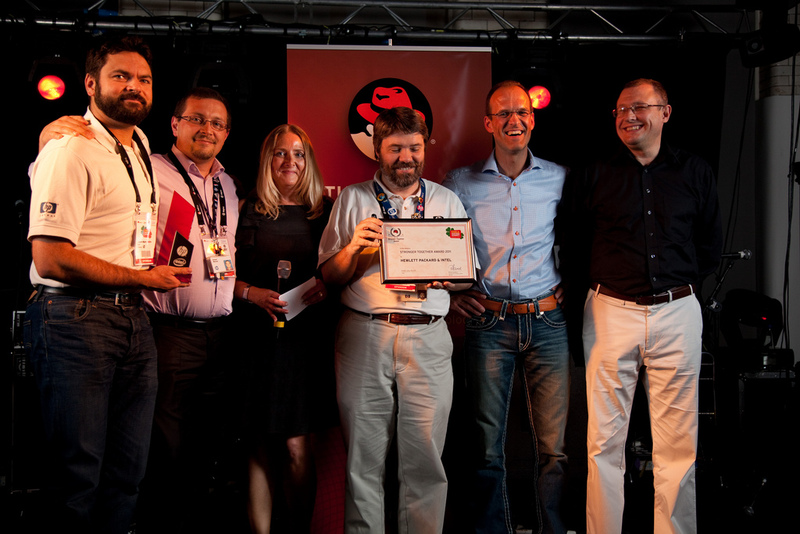 HP and Intel have been honored with the Stronger Together Award at the Red Hat EMEA Partner Summit which took place in Dublin 5-8 of June. During the event, HP has delivered keynote and breakout sessions and experts from the Solution Center managed the joint HP and Intel booth. Participants were able to see the HP ProLiant DL980 G7 and to witness demonstrations of advanced virtualization with RHEL 6.1 KVM and SRIOV on top of HP ProLiant Xeon systems as part of the joint HP Intel and Red Hat Open Source Solutions Initiative (OSSI). To learn more about the OSSI and RISC to Linux on ProLiant migrations, you may contact Arnaud Meurant (arnaud.meurant_at_hp.com) or Bruno Cornec (bruno.cornec_at_hp.com) and visit our web site at http://www.hpintelco.net. To learn more on the event, visit http://www.europe.redhat.com/mktg/partnersummit/2011.